Our product range includes a wide range of a4 digital color printer, a6 digital color printer and a6 analog color printer. Delivering a compelling combination of compact convenience, superior image quality and low total-cost-of-ownership, the UP-DR80MD is the world's smallest A4 dye sublimation printer. The UP-DR80MD offers easy colour adjustment via its printer driver property. This incorporates a preview image from which you can confirm and adjust images easily.Two types of colour look up table are available to reproduce suitable colours for different modalities, such as endoscopy and ultrasounds. The default "Natural" setting creates a colour based on the s-RGB monitor, which is suitable for endoscopy images. For ultrasound images, a "CG" colour mode is available that reproduces more vivid colours. These settings are selectable via the printer property. UP-D25MD is the successor of the UP-D23MD. Our objective was to manufacture a user friendly printer, to improve image quality, (up to 423 DPI, colour adjustment software), and to provide a large choice of media (standard / lamination). The UP-D25MD has a more compact design.UP-D25MD has been developed to fit on modern endoscopic trolleys with a width of just 212 mm. The foot position is the same as UP-D23MD.This printer produces highly durable reports that can be kept and used for a long time. Our intelligent fixed ‘ink to sheet consumption’ technology ensures you never run out of ink while paper remains in the printer. 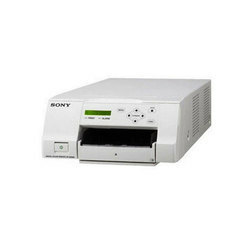 The UP-25MD is a high quality printer designed for medical applications. It features a variety of analogue video inputs for standard definition as well as high definition signals and is compatible with a wide range of medical imaging devices.The printer’s photo-quality dye sublimation technology ensures that prints are durable and long-lasting. 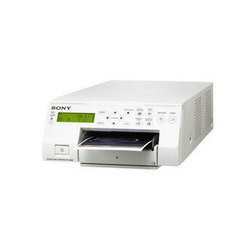 It is compatible with our traditional UPC-21S/L media series and the self-laminating media UPC-24SA/LA. 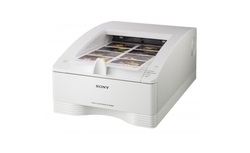 It seals and protects printed images against environmental hazards. Colours can be adjusted using RGB or HSV colour spaces to match monitor output and to optimise colour reproduction accuracy.